The third book in Chelsea Mueller’s Soul Charmer series comes out in a month. A month, y’all. She also used heart eyes when talking about Callie and Derek’s relationship in this book. Just sayin’. So who deserves dibs on an early, signed copy of Lost Souls? A VBC reader, obviously. Y’all have been with me for damn near a decade. So I’ve got shiny paperbacks in my hands, and I want to sneak one out early to one of you. Standard Win It Wednesday deal here. Enter below. Open internationally. I’ll personalize the book to the winner and probably sneak some new swag into the package because that’s what I do. …and if you can’t wait, pre-orders are super rad. Callie’s magic is finally her own. She and Derek dispatched Ford. They should have been able to breathe, but layers of sin run deep beneath Gem City. Another mob boss quickly rises, and his sights are firmly set on Callie–and her family. Only the more magic she uses, the more danger finds her. A break-in, pools of blood, and bare shelves at the Soul Charmer’s store force Callie to choose the fates of others. But which can she live with? Losing her city, her love, her family …or her very soul? 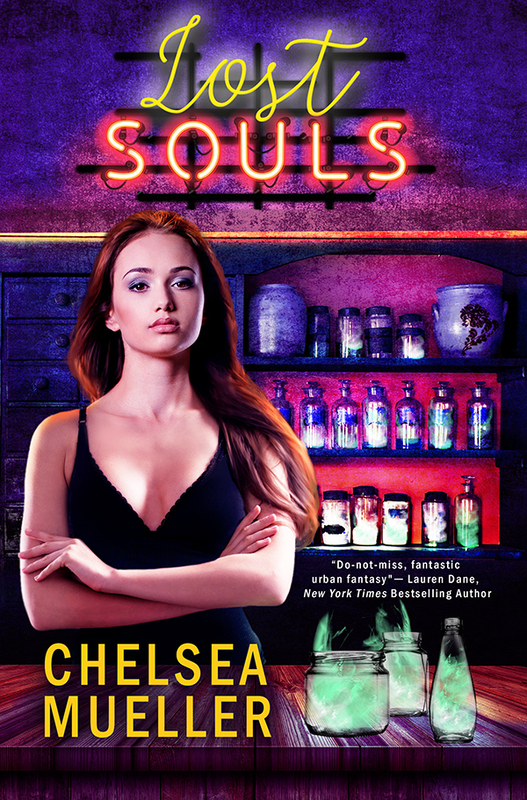 One lucky winner will receive a signed, early copy of Lost Souls by Chelsea Mueller. Fill out the Rafflecopter form below to enter. Standard VBC rules apply. You do not have to share on social media, but if you do you get bonus entries. Same goes for the email sign-up, which will get you VBC stuff, book recs, and book updates from Chelsea Mueller. Currently reading BR Kingsolver Chameleon series. Super good. Currently reading Redeemer by CE Murphy. Looking forward to reading Lost Souls! So I am reading Truthwitch by Susan Dennard and hoping the end gives me some resolution (I know the next book comes out in February but waiting is hard) . Summoned to Thirteenth Grave by Darynda Jones. I am gonna miss Reyes and Charlie so much! Wah! Currently reading Twelfth Grave by Darynda Jones. The Ottoman Centuries by Lord Kinross. currently reading Leverage In Death to get in the mood for the next book, Connections In Death. Then The Last Second by Catherine Coulter and JT Ellison is next for review. Yay! I loved that book… and Tess and Shade.